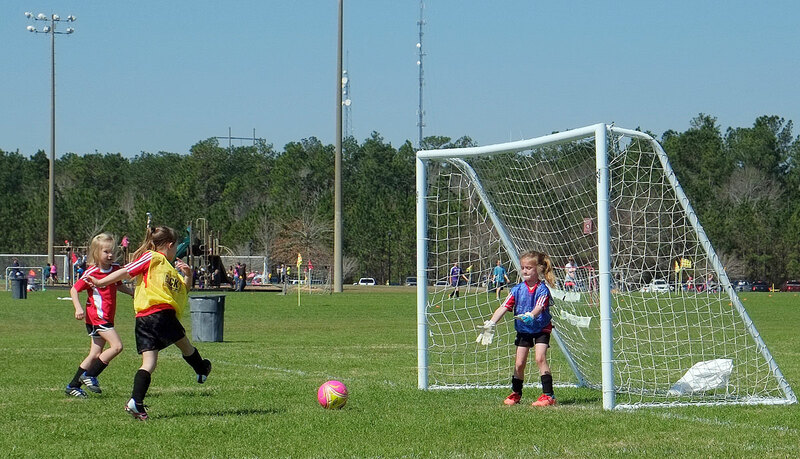 Most teams in recreational leagues, or even travel leagues at young ages, will not have a designated goalkeeper. Chances are that each player on your team will play at least one half during a season as a goalie, and those who really loved playing the position will want to do it for a second time if there are more halves in the season than players on your team. Therefore it is unlikely that you will spend any considerable amount of time at your practice sessions on goalkeeping drills. Below, we offer some tips that are easy for you to communicate, and easy for the players in goal to understand, and that do not need much practice to make your goalkeepers effective. What I have done in the past is that I decided before my weekly practice who my two goalies will be at the next game and then I let them split time in goal during shooting drills at the end of that practice and again during the warmups before the game. Both, at practice, and during the warmups, I reminded them of these three things. When a shot is coming at you, make sure not to stick out a foot or a hand to stop the shot. Rather, move your whole body over so that if you don’t catch the ball, it bounces off of the body and away from the goal. In the same spirit, when scooping up a ball, do not bend over to get it as it might go through your hands and then your legs and behind you into the goal, but kneel down, so that if it goes through your hands it will bounce off of your knee and back away from the goal. Roll over to the side so that you don’t do a belly flop. First the ankle, then the knee, then the hip, and finally the rest of the body gets on the ground as the arms extend either in front of their chest or above their heads. Once comfortable with the roll, the player can try to dive out to the side for spectacular saves. The most common mistake young goalkeepers make is that they think they have to stay on the goal line as the other team is attacking towards them. Chances are that the other team is on a breakaway, and if that is true, the forward coming at your goal is likely not keeping the ball close to them. Tell the goalkeeper to wait for the player to take a heavy touch forward, and as soon as that touch is taken, to run out and clear the ball out wide for a throw-in (not up the middle because it often hits the forward and then bounces behind the goalkeeper leaving the forward with an empty net). Playing goalie can be boring for kids, especially if your team is doing quite well and the majority of the game is being played in the other team’s half of the field. In one game, my U-8 team was doing a great job of keeping the ball in the opponent’s half, and naturally I was focused on that half of the field until I heard a bunch of parents behind me laughing and saying “What is he doing?” I swiveled my head to find that our goalkeeper had walked into the goal and gotten stuck in the net he was climbing on. Needless to say I failed as a coach as I was not paying attention to the goalie not paying attention to the game. A long clearance or a quick breakaway could have cost us a goal at a time the majority of the game was played in the other team’s half. Goalies should also be reminded that they are the last players on the field, not the only ones, responsible for keeping the other team from scoring. This should help dissipate any stress they may feel and help them enjoy the experience.